What is even less fun than having no heat during the cold season? Having no hot water, of course. At least when your heater fails, you can bundle up in blankets to stay warm. But there is no respite for those icy showers. Cold plus wet equals miserable. Sadly, most homeowners completely miss the warning signs that their hot water heater is about to retire itself. We don’t want any of our clients to ever have to go through this. We especially don’t want you to be without hot water while it is still cold outside. Here’s hoping these timely tips will help alert you to any maintenance, repair, or replacement needs your water heater may have. Does Your Water Heater Have a Birthday Coming Up? In most cases, any water heater that has reached the 10-year mark is likely within two years of the manufacturer’s suggested retirement age. Most water heater manufacturers offer an estimated useful service life of 8 to 12 years, so in some cases, reaching 10 years old may be a milestone indeed! 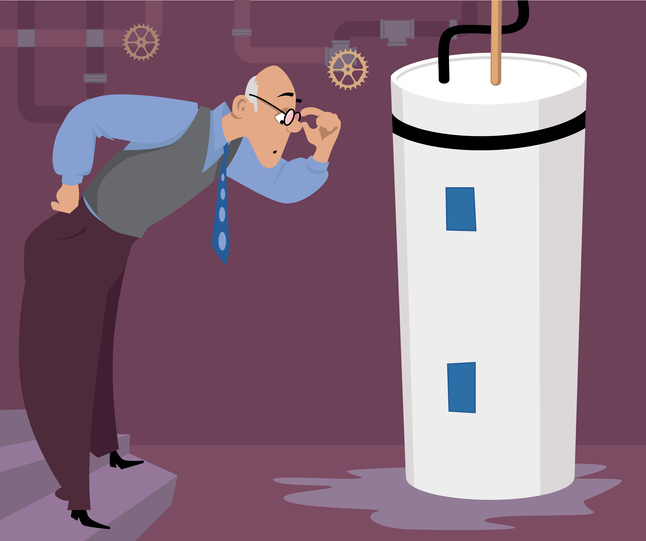 Your first assignment, then, is to figure out how old your current water heater actually is. In some cases, this is harder than it sounds. Maybe you inherited the water heater when you bought the house or cottage and you have no idea of its age. If this describes your situation, here is one way to find out (ONLY if it is safe for you to do so): Look for the manufacturer’s sticker on the water heater. Find the code (hint: it is usually a long string of numbers and letters), because hidden in this code is the water heater’s birthdate! Otherwise, you can call the manufacturer and give them the code for a quick answer. If your water heater is on its last legs, it will typically begin emitting warning signs first. If you are alert, you can catch one or more of these warning signs before you are suddenly confronted with taking a cold shower before work one morning. Warning Sign 1: There is water outside the water heater as well as inside it. When your water heater is working properly, all the water should be inside the water heater. This goes for both tank and tankless varieties. When you start to see water collecting around the base of the water heater or dripping from the valve or overflow pipe or elsewhere on the unit, this is a cry for maintenance at the very least. However, water outside the tank may not be the tank’s fault. It could be due to a leaking valve or pipe or a connection that has come loose. If none of these seem to be the source of the leak, it could be a fracture in the tank itself, which is typically a sign that it is time to replace your water heater. Warning Sign 2: Your hot water looks kind of orange. When the hot water in your household takes on an orange-brown color, you’ve got a rust problem. There are two likely culprits when this occurs: one is rusty galvanized pipes and the other is a rusting water heater tank. Sometimes, both are to blame. But the only way to know for sure is to take a look inside your water heater tank. The best way to check it on your own (ONLY if you feel confident) is to drain the water out of the water heater tank. If the water doesn’t lose its orange cast, your most likely suspect is the interior of the tank rather than any piping. Warning Sign 3: Your hot water heater is starting to talk to you. Water heaters can emit all kinds of interesting sounds—rumbles, clanks, bangs, bonks, and other noises. If your water heater has always been quiet but has recently begun emitting noises, this is a clear call for attention. One of the most common causes of these sounds is hardened sediment lining the inside of the water heater tank. But this is not the only reason your water heater could be making sounds. Warning Sign 4: The water is warm but not hot. If your water heater has decided to produce warm instead of hot water, a common reason is a faulty heating element. This is typically a repair rather than a replacement issue. But if your water heater is in its golden years, it could be more economical (in terms of both energy efficiency and overall investment costs) to simply replace it. Warning Sign 5: The water is hot but smells and tastes strange. If your water takes on an odor or, worse, an unusual flavour, this is not good news for its overall health. This makes sense once we explain the most likely cause, which is that the interior composition of the tank itself is beginning to break down, sending along micro-particles of metal with each request for hot water. Yuck, right? Who wants to cook with, bathe in, or drink metallic water? In nearly every case, this is a clear signal that the time is ripe to replace your water heater. Here at Shipton’s, we want to make sure your hot water heater is producing clean, hot water that is safe for your use! Give us a call to schedule your water heater’s annual checkup.